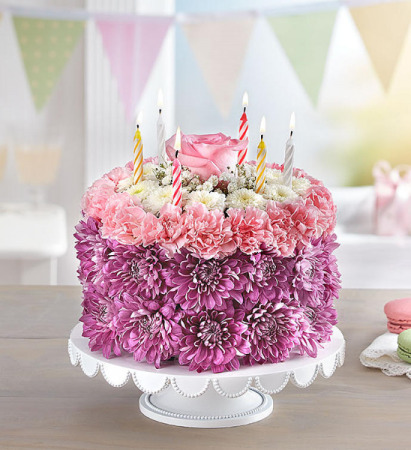 EXCLUSIVE No matter how you slice it, our Birthday Wishes Flower Cake will make their day! Handcrafted from carnations and poms in soft hues of pink, lavender, and white, it’s a one-of-a-kind centerpiece for a memorable celebration. Want to make the day even more special? A birthday balloon will take the fun to new heights! 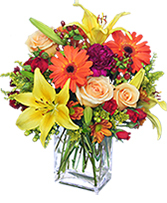 Our florists hand-design each arrangement, so colors and varieties may vary due to local availability. 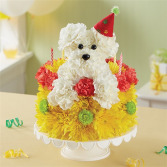 EXCLUSIVE Celebrate a loyal friend on their birthday with our unique and whimsical Pupcake™! Crafted of white carnations and topped with a festive party hat, our adorable pup pops out from our cake of fresh vibrant blooms. Served up on a pedestal stand and accented with candles, it’s an unforgettable way to bring fun to their celebration. Please note we will be Closed Easter Sunday 4.21 *In honor of those that serve we always offer a 10% Veteran, Military, Police and Firefighter discount.